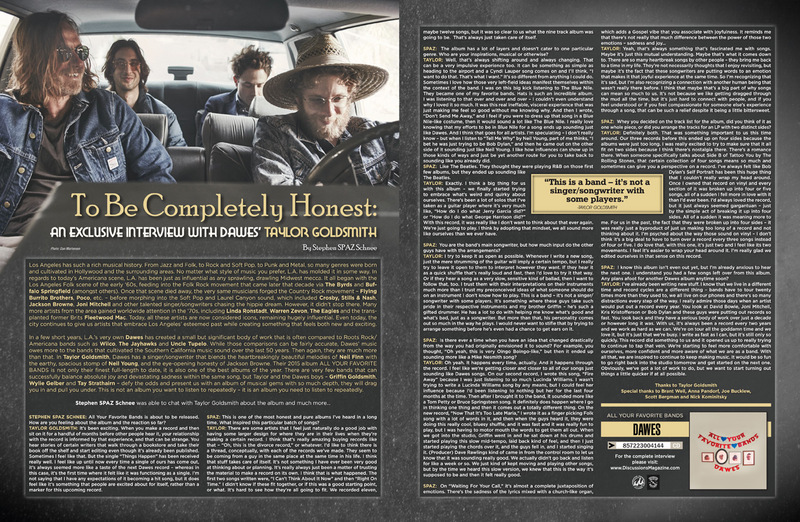 Discussions Magazine Music Blog: DAWES' Taylor Goldsmith: An EXCLUSIVE interview! DAWES' Taylor Goldsmith: An EXCLUSIVE interview! Los Angeles has such a rich musical history. From Jazz and Folk, to Rock and Soft Pop, to Punk and Metal, so many genres were born and cultivated in Hollywood and the surrounding areas. No matter what style of music you prefer, L.A. has molded it in some way. In regards to today’s Americana scene, L.A. has been just as influential as any sprawling, drawling Midwest mecca. It all began with the Los Angeles Folk scene of the early ‘60s, feeding into the Folk Rock movement that came later that decade via The Byrds and Buffalo Springfield (amongst others). Once that scene died away, the very same musicians forged the Country Rock movement – Flying Burrito Brothers, Poco, etc. – before morphing into the Soft Pop and Laurel Canyon sound, which included Crosby, Stills & Nash, Jackson Browne, Joni Mitchell and other talented singer/songwriters chasing the hippie dream. However, it didn’t stop there. Many more artists from the area gained worldwide attention in the ‘70s, including Linda Ronstadt, Warren Zevon, The Eagles and the transplanted former Brits Fleetwood Mac. Today, all these artists are now considered icons, remaining hugely influential. Even today, the city continues to give us artists that embrace Los Angeles’ esteemed past while creating something that feels both new and exciting. 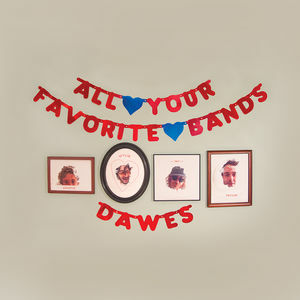 In a few short years, L.A.’s very own Dawes has created a small but significant body of work that is often compared to Roots Rock/Americana bands such as Wilco, The Jayhawks and Uncle Tupelo. While those comparisons can be fairly accurate, Dawes’ music owes more to the bands that cultivated the Southern California music sound over the last 50 years. Then again, they are much more than that. In Taylor Goldsmith, Dawes has a singer/songwriter that blends the heartbreakingly beautiful melodies of Neil Finn with the earthy, spacious stomp of Neil Young, and the eye-opening honesty of Jackson Browne. Their 2015 album All Your Favorite Bands is not only their finest full-length to date, it is also one of the best albums of the year. There are very few bands that can successfully balance absolute joy and devastating sadness within the same song, but Taylor and the Dawes boys – Griffin Goldsmith, Wylie Gelber and Tay Strathairn – defy the odds and present us with an album of musical gems with so much depth, they will drag you in and pull you under. This is not an album you want to listen to repeatedly – it is an album you NEED to listen to repeatedly. STEPHEN SPAZ SCHNEE: All Your Favorite Bands is about to be released. How are you feeling about the album and the reaction so far? TAYLOR GOLDSMITH: It’s been exciting. When you make a record and then sit on it for a handful of months before other people hear it, your relationship with the record is informed by that experience, and that can be strange. You hear stories of certain writers that walk through a bookstore and take their book off the shelf and start editing even though it’s already been published. Sometimes I feel like that. But the single “Things Happen” has been received really well. I feel like up until now every time a single of ours has come out, it’s always seemed more like a taste of the next Dawes record – whereas in this case, it’s the first time where it felt like it was functioning as a single. I’m not saying that I have any expectations of it becoming a hit song, but it does feel like it’s something that people are excited about for itself, rather than a marker for this upcoming record. SPAZ: This is one of the most honest and pure albums I’ve heard in a long time. What inspired this particular batch of songs? TAYLOR: There are some artists that I feel just naturally do a good job with having some larger design for where they are in their lives when they’re making a certain record. I think that’s really amazing buying records like that – “Oh, this is the divorce record,” or whatever. I’d like to think there is a thread, conceptually, with each of the records we’ve made. They seem to be coming from a guy in the same place at the same time in his life. I think that stuff takes care of itself. It’s not something I have ever been very good at thinking about or planning. It’s really always just been a matter of trusting the material to make a record on its own. I think that is what happened. The first two songs written were, “I Can’t Think About It Now” and then “Right On Time.” I didn’t know if these fit together, or if this was a good starting point, or what. It’s hard to see how they’re all going to fit. We recorded eleven, maybe twelve songs, but it was so clear to us what the nine track album was going to be. That’s always just taken care of itself. SPAZ: The album has a lot of layers and doesn’t cater to one particular genre. Who are your inspirations, musical or otherwise? TAYLOR: Well, that’s always shifting around and always changing. That can be a very impulsive experience too. It can be something as simple as heading to the airport and a Cyndi Lauper song comes on and I’ll think, “I want to do that. That’s what I want.” It’s so different from anything I could do. Sometimes I love how those very left-field ideas manifest themselves within the context of the band. I was on this big kick listening to The Blue Nile. They became one of my favorite bands. Hats is such an incredible album. I was listening to that over and over and over – I couldn’t even understand why I loved it so much. It was this real ineffable, visceral experience that was just making me feel so good without me knowing why. And then I wrote, “Don’t Send Me Away,” and I feel if you were to dress up that song in a Blue Nile-like costume, then it would sound a lot like The Blue Nile. I really love knowing that my efforts to be in Blue Nile for a song ends up sounding just like Dawes. And I think that goes for all artists. I’m speculating – I don’t really know – but when I listen to “Tell Me Why” by Neil Young, part of me thinks, “I bet he was just trying to be Bob Dylan,” and then he came out on the other side of it sounding just like Neil Young. I like how influences can show up in those kinds of ways and just be yet another route for you to take back to sounding like you already did. SPAZ: Like The Beatles. They thought they were playing R&B on those first few albums, but they ended up sounding like The Beatles. TAYLOR: Exactly. I think a big thing for us with this album – we finally started trying to embrace what’s weird and quirky about ourselves. There’s been a lot of solos that I’ve taken as a guitar player where it’s very much like, “How do I do what Jerry Garcia did?” or “How do I do what George Harrison did?” With this record, it was really like I don’t want to think about that ever again. We’re just going to play. I think by adopting that mindset, we all sound more like ourselves than we ever have. SPAZ: You are the band’s main songwriter, but how much input do the other guys have with the arrangements? TAYLOR: I try to keep it as open as possible. Whenever I write a new song, just the mere strumming of the guitar will imply a certain tempo, but I really try to leave it open to them to interpret however they want. If they hear it as a quick shuffle that’s really loud and fast, then I’d love to try it that way. Or if they hear a song as a very slow, sensitive kind of ballad, then I want to follow that, too. I trust them with their interpretations on their instruments much more than I trust my preconceived ideas of what someone should do on an instrument I don’t know how to play. This is a band – it’s not a singer/songwriter with some players. It’s something where these guys take such pride in their respective instruments and my brother Griffin – he’s such a gifted drummer. He has a lot to do with helping me know what’s good and what’s bad, just as a songwriter. But more than that, his personality comes out so much in the way he plays. I would never want to stifle that by trying to arrange something before he’s even had a chance to get ears on it. SPAZ: Is there ever a time when you have an idea that changed drastically from the way you had originally envisioned it to sound? For example, you thought, “Oh yeah, this is very Oingo Boingo-like,” but then it ended up sounding more like a Mike Nesmith song? TAYLOR: Oh yeah. It happens every time, actually. And it happens through the record. I feel like we’re getting closer and closer to all of our songs just sounding like Dawes songs. On our second record, I wrote this song, “Fire Away” because I was just listening to so much Lucinda Williams. I wasn’t trying to write a Lucinda Williams song by any means, but I could feel her influence because I’d been listening to nothing but her for the last four months at the time. Then after I brought it to the band, it sounded more like a Tom Petty or Bruce Springsteen song. It definitely does happen where I go in thinking one thing and then it comes out a totally different thing. On the new record, “Now That It’s Too Late Maria,” I wrote it as a finger picking Folk song with a lot of words in it, and then when the guys heard it, they were doing this really cool, bluesy shuffle, and it was fast and it was really fun to play, but I was having to motor mouth the words to get them all out. When we got into the studio, Griffin went in and he sat down at his drums and started playing this slow mid-tempo, laid back kind of feel, and then I just started playing the chords over it, and the guys fell in, and I started singing it. (Producer) Dave Rawlings kind of came in from the control room to let us know that it was sounding really good. We actually didn’t go back and listen for like a week or so. We just kind of kept moving and playing other songs, but by the time we heard this slow version, we knew that this is the way it’s supposed to be and then it felt really good. TAYLOR: Yeah, that’s always something that’s fascinated me with songs. Maybe it’s just this mutual understanding. Maybe that’s what it comes down to. There are so many heartbreak songs by other people – they bring me back to a time in my life. They’re not necessarily thoughts that I enjoy revisiting, but maybe it’s the fact that these songwriters are putting words to an emotion that makes it that joyful experience at the same time. So I’m recognizing that it’s sad, but I’m also recognizing a connection with another human being that wasn’t really there before. I think that maybe that’s a big part of why songs can mean so much to us. It’s not because we like getting dragged through the mud all the time, but it’s just hard to connect with people, and if you feel understood or if you feel compassionate for someone else’s experience through a song, that can be such a relief despite it being a little bittersweet. SPAZ: Whey you decided on the track list for the album, did you think of it as one whole piece, or did you arrange the tracks for an LP with two distinct sides? TAYLOR: Definitely both. That was something important to us this time around. Our three records before this ended up on four sides because the albums were just too long. I was really excited to try to make sure that it all fit on two sides because I think there’s nostalgia there. There’s a romance there. When someone specifically talks about Side B of Tattoo You by The Rolling Stones, that certain collection of four songs means so much and sometimes can give you a perspective on a record. I’ve always felt like Bob Dylan’s Self Portrait has been this huge thing that I couldn’t really wrap my head around. Once I owned that record on vinyl and every section of it was broken up into four or five songs, all of a sudden I fell more in love with it than I’d ever been. I’d always loved the record, but it just always seemed gargantuan – just by the simple act of breaking it up into four sides. All of a sudden it was meaning more to me. For us in the past, the fact that they were broken up into four sides – it was really just a byproduct of just us making too long of a record and not thinking about it. I’m psyched about the way those sound on vinyl – I don’t think it’s a big deal to have to turn over a record every three songs instead of four or five. I do love that, with this one, it’s just two and I feel like its two movements. I feel it’s easier to wrap your head around it. I’m really glad we edited ourselves in that sense on this record. SPAZ: I know this album isn’t even out yet, but I’m already anxious to hear the next one. I understand you had a few songs left over from this album. Any plans afoot for another Dawes album anytime soon? TAYLOR: I’ve already been writing new stuff. I know that we live in a different time and record cycles are a different thing – bands have to tour twenty times more than they used to, we all live on our phones and there’s so many distractions every step of the way. I really admire those days when an artist would put out a record every year. You look at David Bowie, Joni Mitchell, Kris Kristofferson or Bob Dylan and these guys were putting out records so fast. You look back and they have a serious body of work over just a decade or however long it was. With us, it’s always been a record every two years and we work as hard as we can. We’re on tour all the goddamn time and we love it, but it’s just that we’re busy. I write as fast as I can, but it’s still only so quickly. This record did something to us and it opened us up to really trying to continue to tap that vein. We’re starting to feel more comfortable with ourselves, more confident and more aware of what we are as a band. With all that, we are inspired to continue to keep making music. It would be so fun to go right back into the studio tomorrow and get started on the next one. Obviously, we’ve got a lot of work to do, but we want to start turning out things a little quicker if at all possible.